With Ghent’s Circulation Plan coming into effect in 2017, the city centre has been transformed into a low-traffic zone. But if public transport isn’t an option and you need a car, then you’ll also need somewhere to park it. 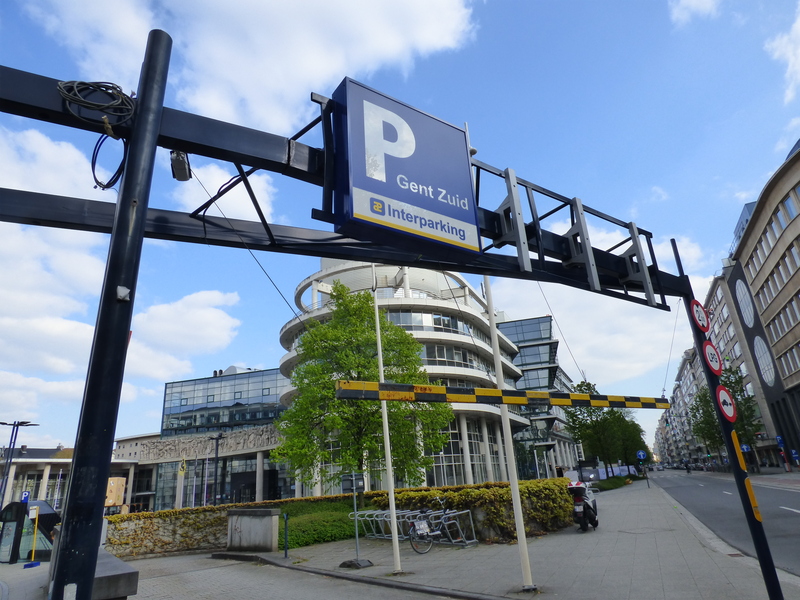 Read on for an overview of the key things to know about parking in Ghent. The graphics on this article also helpfully display a comparison of parking costs in the city. Ghent’s streets are divided into paid parking zones – red, orange, yellow and green. The colourful map here lets you know which streets are in which zone. Unsurprisingly perhaps the cheapest zone is green and this is furthest out from the centre. The most expensive (the historic city centre) is the red zone. The pricing is divided into day (9am-7pm) and night (7pm-9am) fares per zone. The table next to the map on the above link lists the price per duration. Street signs (like the one pictured below) also indicate where a new zone begins, as well as the days (and sometimes the hours) where paid parking is allowed/applicable. For example, in the red zone, there is a maximum 3-hour stay during the daytime. Find a ticket machine, enter your number plate, choose how long you want to park for, pay (card only) and you’re done. The machine won’t give you a ticket to stick in your front window. When the inspectors come around, they check based on your number plate. The top of the parking machines match the colour of the zone (see main image for a machine in the ‘orange zone’). Ensure that you use a machine with the right colour, especially if you’re parking in an area where two zones meet. Your closest applicable machine might not be the closest to your car. Within the time limit, you can move your car to a cheaper zone without having to pay again. But you cannot ‘upgrade’ to a more expensive zone – you would need to pay again. If you get caught without a virtual ticket, it’s a 30 euro fine to be paid within 14 days. There are free parking options in Ghent but they are mostly Park & Rides slightly outside of the city centre. You can see where they’re located on this map. Each green circle indicates a Park & Ride and the number in the circle tells you how many parking spaces it has. You can park for free but you then need to pay for local public transport as per normal, or use your bike. Read more about the P&Rs here. Note that the P&Rs at the main station (Gent St Pieters) and in Galveston are not free. For Gent St Pieters you will need to apply for a 3 month (125 euros) or 1 year (500 euros) permit to be able to park there. Galveston offers day parking tickets for 2 euros. There are also plenty of underground garages in Ghent which tend to be cheaper than the street parking. If you’re only here for a few months, and you won’t be getting a resident’s card (verblijfskaart), then you might be better off getting a monthly pass for an underground garage. The prices are shown in the tables on this page. The garage under Zuid costs 151 euros for a month and their English website here provides more details. Students get a reduced rate (50 euros) but you do have to have a ‘studentabonnement’ card to pay with. There is no parking for students on any of the university campuses. Exception: the Faculty of Veterinary Medicine in Merelbeke. If you have a verblijfskaart (resident’s permit) you can apply for a resident’s parking permit. This allows you to park on the street in the area that you live in. Call into the Mobiliteitsbedrijf at Sint-Michielsplein 9 (see opening hours here) to apply. This permit is valid for up to two years, but it should then be automatically renewed. You’ll receive a letter from the Mobiliteitsbedrijf three weeks before it’s due to expire, to confirm its extension. Up until a few years ago, your permit was an actual piece of paper to stick in your car window. You’ll sometimes still see these in car windows, but today new or renewed permits are digital. This means that when an inspector comes around, they’ll look up your number plate on a hand-held device to ensure that your car is registered. Your car does not need to have Belgian license plates for it to have a permit. The permit is free for your first car but if you want to add extra cars then it’s 250 euros per car per year. Have permanent access to a car i.e. you can’t get a permit if you rent a car now and again. 1) You could park in an underground car park which is the ‘safest’ option for your car (CCTV etc), but of course the most expensive. E.g. the one under the main train station would cost you 18 euros a day. 2) Use a park and ride, which are free, but popular. So if you are arriving on a Saturday (when a lot of people come to shop) then it might take you a while to find a space. You also have to pay for the public transport to wherever you want to go but the P&Rs are often next to tram lines into the centre. 3) Park on the street in the green zone where it costs 3 euros a day, and where there’s more space than in the park and rides. Again, you’d need to connect to the centre via public transport so whether you need a bus/tram or can walk it depends where you end up parking and where you need to go. Hope this helps, and enjoy your trip!